It's been a while since I had the free time to use a Delicious Doodles image but their challenge theme of "Myth or Magic" just inspired me so I grabbed this darling Mushroom Fairy and made a card. and modified it for the size of my image. The satin ribbon is from Really Reasonable Ribbon and that was the last of it so it's time to order more. I'm still practicing my CAS designing so I left off any other embellishments and yes, I do like this one. Your gray and yellow theme is fantastic with your pretty fairy, Connie! What a stunning card with those fabulous pops of yellow! Thanks so much for sharing with us at AHSC. 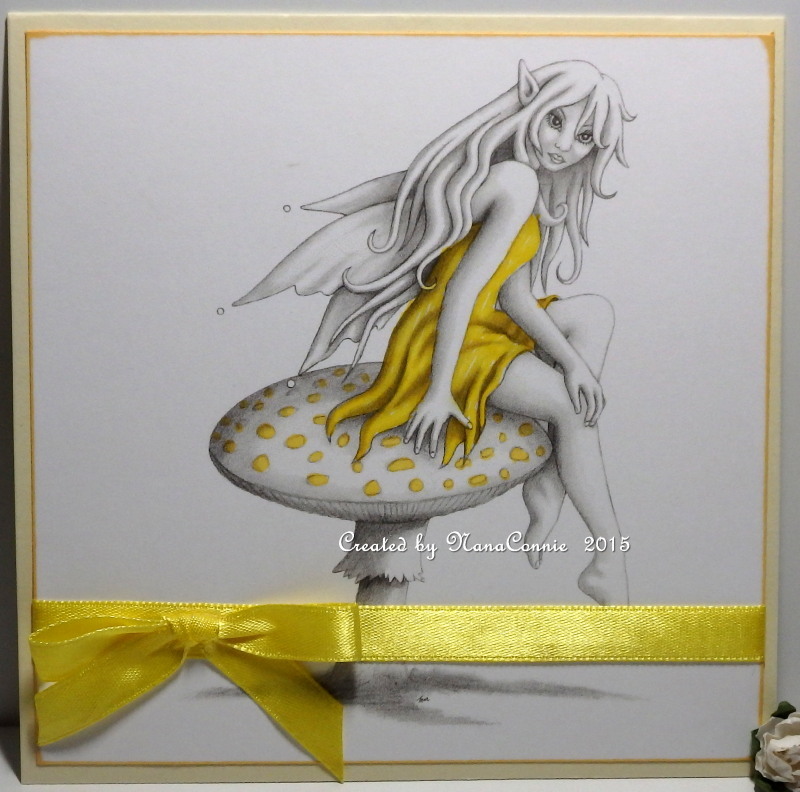 Your fairy image is delightful done in yellow! Thanks for sharing this beautiful card with us at Atlantic Hearts Sketch Challenge. Stunning Connie, love this gorgeous fairy and touch of yellow too. Oh this is so pretty! The way you've left everything grayscale but kept that POP of yellow is a perfect design move!
! love the image & your card is just gorgeous! The colour combo is lovely too! Simple, beautiful & elegant! Thanks so much for sharing with us at Craft Your Passion#270! Awesome!! Thank you so much for entering our ATG challenge at Through The Craft Room Door this week. Looking forward to see you again next challenge. What a fun take on this week's sketch. That fairy is just gorgeous. Thanks for playing along at AHSC. Love that fairy stamp... very pretty card! Thanks for playing along at AHSC! Love how the yellow pops off the card! Thanks for playing along with AHSC this week!! Using the pop of yellow is very effective with your chosen image. Glad you shared your creation at Cardz 4 Guyz. A striking card beautifully coloured. I love the spotlight coloring and the grey and yellow colour combo. Stunning. Thank you for joining us at The Shabby Tea Room. i hope to see you play along again next week! Thanks for joining us over at Lacy Sunshine Color Your World Challenge! What a wonderful card, Connie. Thanks so much for sharing your talents with us, and please join us again soon.